So with the exception of missing New York deep in my bones, I really enjoy living in Lincoln. I love its character, its history. It’s safe, affordable, and a really great place to raise kids. It’s a great little city, a fun college town. 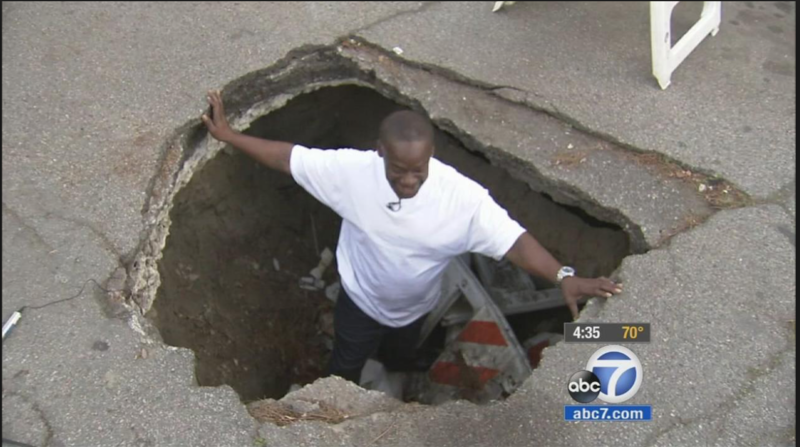 But with all of that greatness comes a dark side, a lurking evil that threatens to destroy every man, woman, and vehicle–the curse of the potholes. You know they joke in New York about the never-ending road construction, how there are always cones scattered around and lanes closed for repairs. But honestly, in a city like New York it makes sense. Take the amount of people, cars, trucks, busses, overall traffic in a city that large constantly punishing the roads and yeah, you’re going to need steady maintenance and repairs. But somehow, it all makes sense. There is noticeable progress. Things eventually get fixed, and stay fixed for a reasonable amount of time. In Lincoln, it makes no sense, ever. 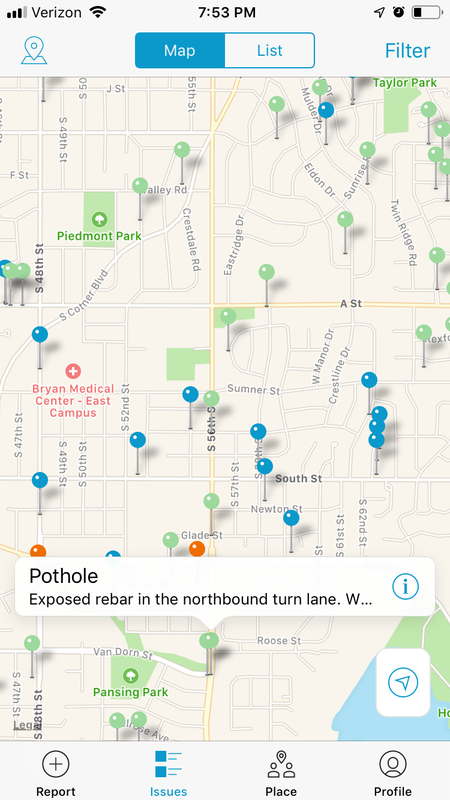 At any given time, you’ll find numerous main roads closed for repair, often all at once, which means you have to get seriously creative cutting through residential neighborhoods to get where you need to go in a reasonable amount of time. And all I want to know is how much traffic do they honestly think we have in this town that warrants an elevated roundabout to keep things under control? Hell, people can’t even figure out how to navigate the “No Right on Red” signs at certain intersections, so they sit there, blaring their horns and cursing out the people in front of them who are simply trying to get to work on time while obeying the clearly posted traffic laws. But all of that has nothing on the potholes. I don’t know what this city did when it paved the streets, but holy hell, you’ve never seen a pothole until you’ve seen a Lincoln pothole. I don’t know if there’s a Guinness Book of World Records category, or some sort of Extreme Home Makeover-style contest we can enter, but we’re definitely overdue. And I’ve got a theory. I think it’s the beet juice brine. The city has been touting this magical formula of beet juice and salt (which they believe is so amazing they actually hired a lawyer to pursue a patent). They mix batches of the stuff and spray it to “pre-treat” the roads for snow and ice. I think the brine is directly responsible for the monster potholes that materialize in the wake of every winter storm–seeping down into the cracks in the concrete, freezing and destroying the structural integrity of the roads. 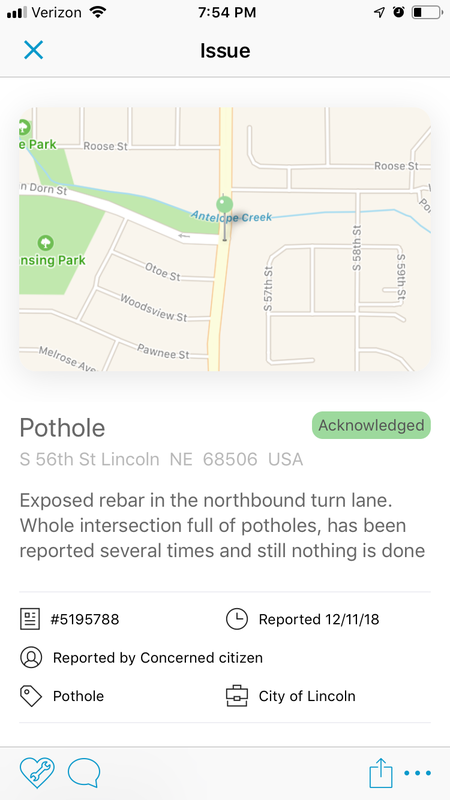 It’s gotten so bad, the city of Lincoln has a Pothole Hotline. You heard me. 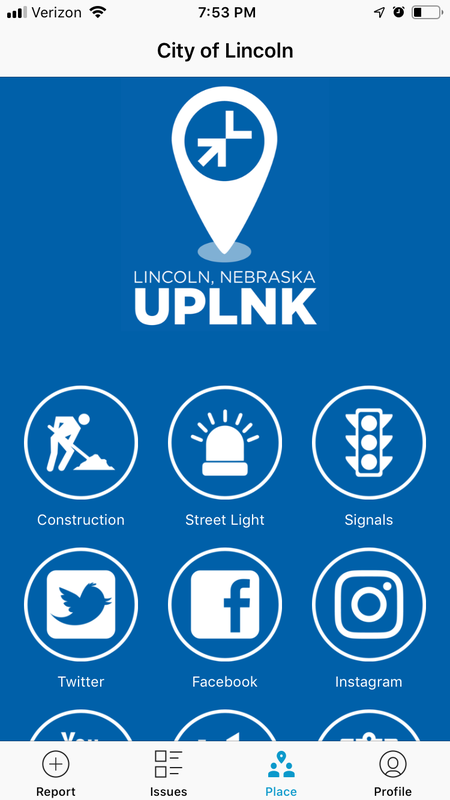 They actually built an app called UpLNK that lets you report things like potholes, icy roads, parking violations, downed trees, and dead squirrels flung into the street by neighbors. Check this out. 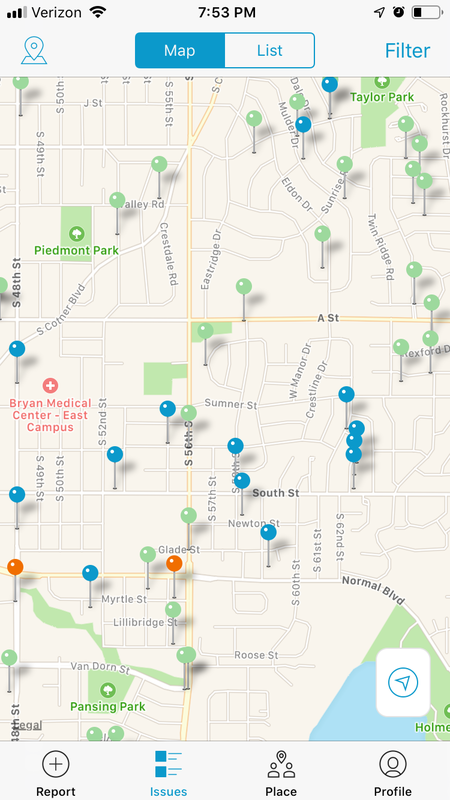 Here are a few screenshots of the app with my favorite feature, the Issues Map. You can upload a report and alert the city to issues that need to be resolved. But the best part? You can add a photo. A photo of the pothole you want fixed. STEP 1 – Take a clear photo of the pothole. Be sure to insert yourself into the photo or include a friend in the shot for scale. * – The CD Skipper – A small pothole that you don’t even see coming, but if you still happen to be rocking a CD player in your car, you’re going to skip a track and get annoyed. ** – The Tongue Biter – You might have noticed this pothole right before you hit it, and it was big enough for you to bite our tongue and spill a bit of coffee on your pants. Annoying, but no lasting damage. *** – The Tire Popper – You saw this one coming, and if you were lucky enough to avoid it, you might be able to go about the rest of your day in peace. If not, you might have to pop the trunk and change a tire because yours just got shredded. **** – The Axle Buster – You spotted this one a mile away, but if you’re boxed in with traffic, you might not be able to avoid it. Hope you’ve got the mechanic on speed dial, because you’re probably going to need a little work to fix that shimmy. ***** – The Transmission Drop (AKA The Fender Bender) – You saw it. You braced for it. And then you realized you were likely going to total your car, so you tried to pull some sweet evasive maneuver at the last minute. There’s no chance you or your car are making it out of this one without some permanent damage and emotional distress. STEP 3 – Get your friends to download the app, and repeat. The only way things are going to get better is if we all work together. Let’s do this people. And go!